t says: First things first: yes, I know that the actual Star Wars quote is one of the most commonly misquoted quotes ever, as it is much longer than “Luke … I am your father”. Ok – now that that’s settled, let’s talk about the real topic of this post: Luke’s Lobster. Armed with the knowledge of a relatively new outpost on 17th street, g and I decided to make the most of a beautiful weekend day by ordering us up some lobster rolls. April 2014, Friday Lunch, Party of 2 … at home! 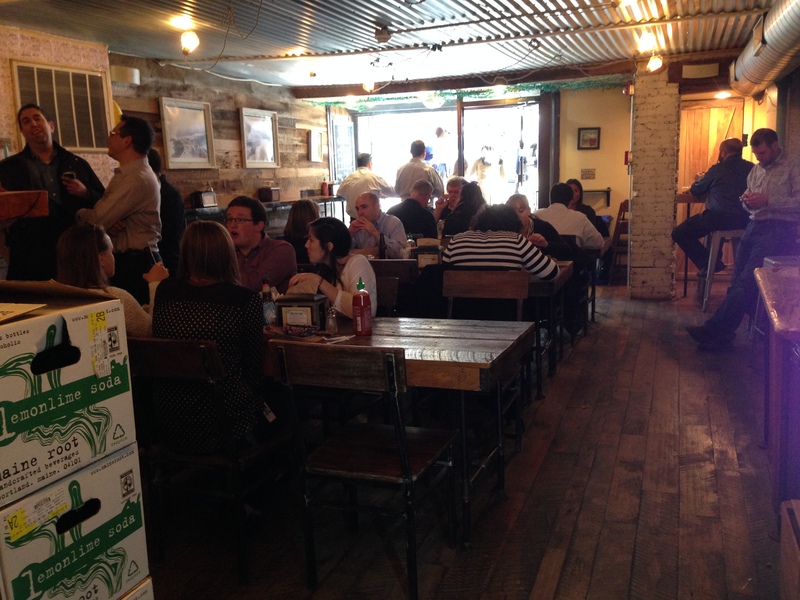 We picked the lobster rolls from Luke’s , and it was quite packed! But, the staff knows how to move through the line pretty quickly, and most people flocked to the street with their Luke’s bags, likely to go back to work. 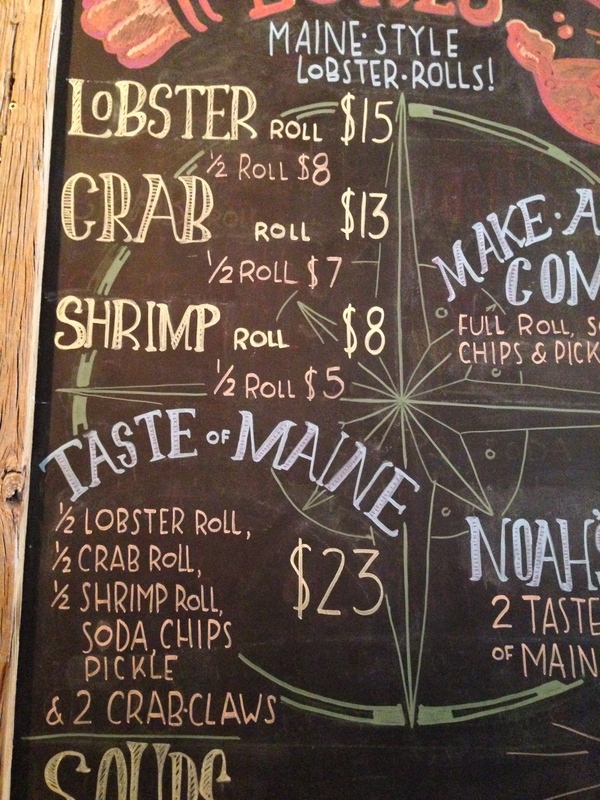 the board tells all: the menu is small, but do you really need anything other than lobster, crab, or shrimp rolls? not really. sure, there are things like soup and crab claws, but who really cares about those? we want us some rolls! 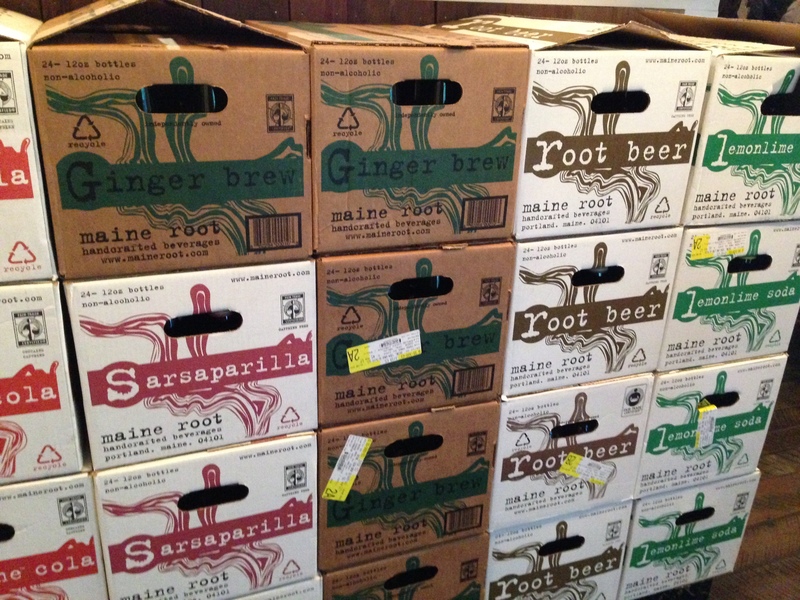 when we saw all these maine-sourced sodas, we had to take a pic for bw. they run a tight ship in their little sub-ground shop – it does feel kind of like a little out-of-the-way shack somewhere in New England. the crab roll: this 1/2 crab roll was loadd to the brim with beautifully succulent crab meat – it was quite delicious indeed. and with the light sprinkling of some seasoning, it was clear that the name of the game was “taste this crab”. My only criticism is that the chunks of crab are quite small, so you do miss out on the feeling of biting into a nice big piece that might have come from a crab claw, but i guess i can’t complain if i’m not the one doing the meat picking. now here is the main event. don’t be fooled by this extreme close-up. luke’s “rolls” are quite small. I’d say about 6 inches for the whole. They do load it up with an impressive amount of intact claw meat, and the flavor is quite nice. 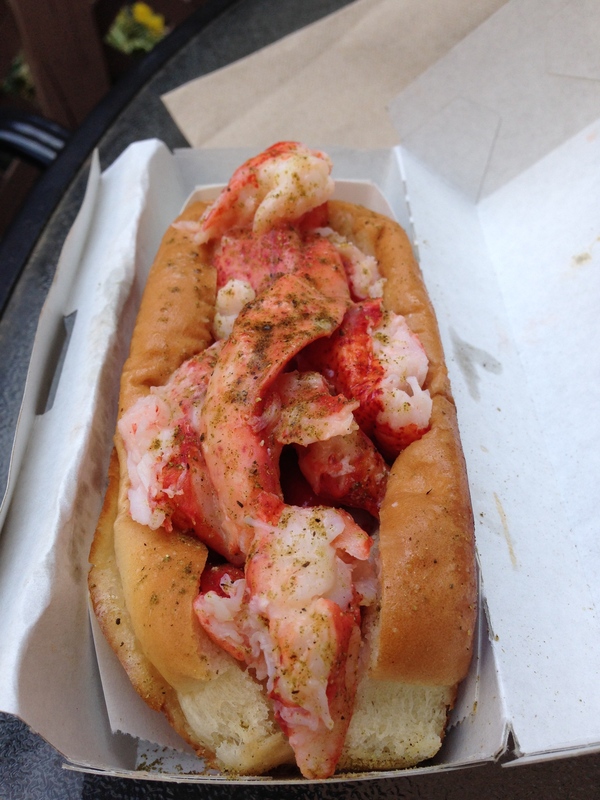 once again, the dressing is kept to a minimum, so you’re really enjoying a crapload of lobster on a buttery bun. 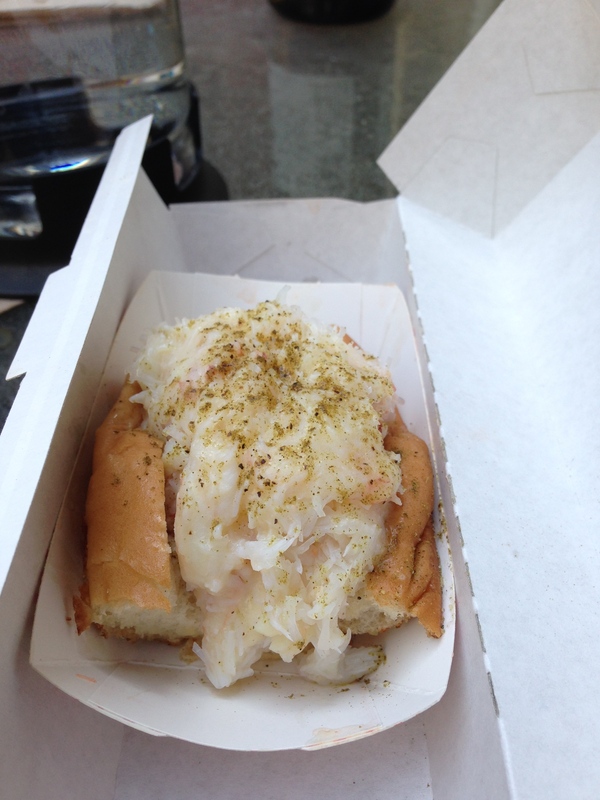 for me, the lobster roll was superior to the crab … and that says a lot because i’m actually not that big of a lobster fan – i’m much more of a crab guy. but there was something about biting into a huge chunk of well-prepared lobster (it was not tough/dry/rubbery at all) that put a smile on my face. g was all about it, showing her roll no mercy. Mix the above sandwiches with a glass of lemony 2012 Ransom Riesling from our cellar, and what we had was a perfect outdoor lunch on our patio. It was just the right size to quench our hunger but keeping our stomachs un-bursting enough so we could enjoy walking, shopping, errands, and whatever else it was we had to do outside. But, there was a pretty obvious corollary here: these suckers are quite small. At around 6″ each, my dad could easily down two of these things … which would make for a pretty darn expensive lunch. We now know why so many people were getting “combos” with chips and soda – the other items would help fill them up. Does that mean “it’s not worth it” … no! It was absolutely worth it. We envision a summertime outdoor party, with lots of white wine, some home-made sides, some fruit-filled pies, and a platter of lobster rolls. Now THAT is how we party.